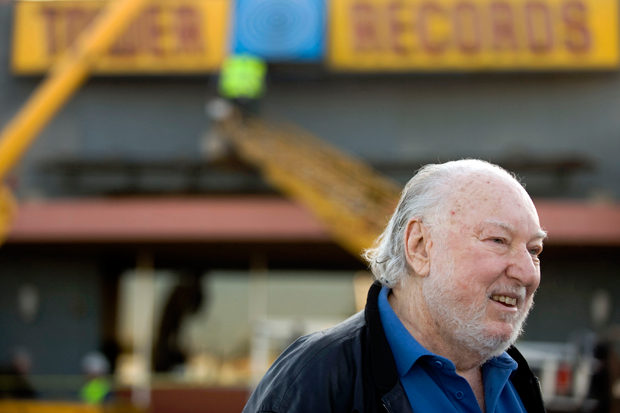 In 2006, two years after filing for Chapter 11 bankruptcy and 46 years spent steering one of the most recognizable music retail chains in the country, Tower Records founder Russell Solomon was forced to shutter and sell all 93 of his U.S. stores. The reasons for the Sacramento-based chain’s death were myriad — individual locations’ retail mismanagement and the general encroachment of the digital age were two primary culprits — but regardless, all that’s left these days are an online physical retailer owned by another company and a handful of TOWER RECORDS signs left behind at old store locations. But that’s not the end of the story for Solomon, according to USA Today’s PopCandy. After the other record store he started post-Tower, R5 Records, was sold to local Sacramento shop Dimple Records in 2010, the entrepreneur is resurrecting his most successful venture in the only way possible in the Spotify age: by memorializing it in archival format. In collaboration with the Center for Sacramento History, Solomon has launched the Tower Records Project, which will continue the efforts he began in 2009 by donating “over 200 boxes of Tower-related history — artwork, photographs, memorabilia, awards, business records and correspondence, office furnishings and even the neon signs from the first stand-alone store.” The donated objects will be publicly available for viewing and he’s also encouraging Tower friends, fans, and former employees to pitch in with their own stockpiles (and financial donations) to the physical memory of “a cultural epicenter, an extended family, a way of life and a scene unto itself,” as its fancy official site calls it. To kick off the project, there will be an all-day event held this Thursday in the Dimple Records parking lot. Beginning in September, Solomon and the Center will process, catalog, and perform preservation work on the collection, to store, digitize, and otherwise make it accessible. If all goes according to plan, the collection, according to the project website, may become a traveling exhibit by 2015. Donations to the project come with Kickstarter-esque level-based prizes.